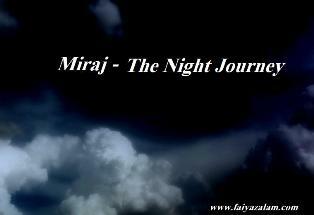 This was a difficult time in the life of Prophet Muhammad (swa), and this journey was a great compliment to him. The deliverance of the message was entering a new phase, and the establishment of the Muslim nation was about to begin. Prophet Muhammad (swa) was feeling overwhelmed and alone. The vast majority of Meccans had refused to heed his call or accept his message. Both his beloved uncle and cherished wife had died, and this gift (Miraj) of Allah swt offered him support and opened his eyes to the signs and wonders of the universe.